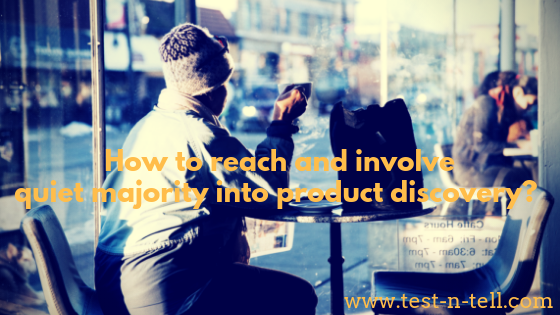 The other group, or quiet majority, is the backbone of your product success. Only you don't hear from them. They don't write on forums. Don't answer your NPS invites. Rarely go to industry conferences. But it doesn't mean they don't have an opinion. Very often they have great, extremely valuable feedback that could massively improve your product. Only if you could find a way to engage them in a conversation. How to get feedback from a quiet majority? Probably the easiest way to find the quiet majority is to look at your product KPIs. Filter users who are benefiting from your product at an average rate. Means: some of your users (small percentage) get much more value from your product than average. And then another small portion of your users get very little benefits out. All other users should be somewhere in the middle. This is your majority. To filter out quiet ones - start from those who never got in touch. They still need to be active users but unresponsive, unengaged into product discovery. One word: incentives. Often, people have good reasons not to talk to you. Most often the reasons come down to one principle: they don't think the effort worth the benefits. You need to change that perception. As simple as that. Offer monetary incentives if you want to reach and get feedback from the quiet majority. You see companies doing it all the time. "Fill this survey for a chance to win..."
"Ten minutes of your time for a cup of coffee"
"An hour Skype chat for fifty quid Amazon voucher"
This way is straightforward but be cautious about the quality of feedback you will receive. Some people might want to get incentives without providing genuine feedback. Some users never give you feedback because they are sure nothing will change. Those folks don't know how you make your product decisions but they feel like their feedback doesn't matter. If you can convince them that what they have to say has a huge value for you - it might engage them into product discovery. There is no better way to show users you value their feedback than by fixing a problem they care about or follow up on their ideas. This way is potentially cheaper and more genuine, but it comes with a caveat as well. As a product manager, you need to solve problems for all (or substantial subset) of your users. If a representative of a quiet majority group gives you feedback that relevant only for them - you can't accept it into the product. Which could negatively influence the will of this particular user to provide further feedback. What could be helpful in this situation is to be honest and transparent. Just say like it is. "The idea is interesting, but it is unlikely to benefit other users." Be mindful about different types of users your product has. There always will be an active, vocal group. People who will make sure their opinions are heard. It might be useful feedback. But vocal user group tend to be a minority. Most of your users are likely to be quiet. They will be difficult to engage in product discovery. But it's vital to reach them and get their feedback. To achieve that you might need to incentivise the quiet majority in providing feedback. You might do that with monetary rewards or by showing your users that their feedback increases the value they are getting from using your product.